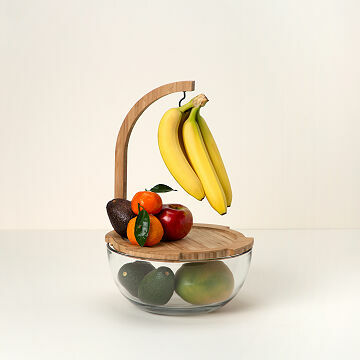 Organize your fruit by ripeness with Myles Geyman's smart glass and maple design. Your local peaches are ready to eat but the avocados need more time—make the most of all your fruit with Myles Geyman's smart storage. Ready-to-eat goes on top of the maple tray, not-quite-ready goes in the vented glass bowl. Hang bananas on the built-in hook to help those potassium powerhouses ripen evenly. Designed to fit under kitchen cabinets or display on an island, this elegant design lets you enjoy your fruit at its sweet spot. Glass bowl made in Lancaster, Ohio. Solid maple tray and banana hook made in Dorset, Vermont. Want to know more about what makes this vessel so special? Check out our blog. Myles Geyman's smart storage helps you make the most of all your fruit. Ready-to-eat goes on top of the maple tray, not-quite-ready goes in the vented glass bowl. Hang bananas on the built-in hook to help those potassium powerhouses ripen evenly. Designed to fit under kitchen cabinets or display on an island, this elegant design lets you enjoy your fruit at its sweet spot. Teak oil, North American native wood, and glass. The Just Ripe Fruit Bowl is packaged in a partially recycled and recyclable/compostable corrugated box, with partially recycled and recyclable/ compostable paper fill. There's one place—and only one place—where you'll find the Just Ripe Fruit Bowl: UncommonGoods. Wash lid with warm, soapy water and dry immediately. For long term care, apply mineral oil or beeswax wood conditioner every few months. Glass bowl is dishwasher safe. Awesome fruit bowl plan on purchasing more ! This bowl is awesome ! Useful and space efficient buy. But the fruit hangar portion is held by a single weak screw. Lasted about eight months before I started drooping and then broke. I need two of these! The banana holder is pretty sturdy so no flimsiness there. It's bigger than I expected so I don't recommend it for small apartments unless you don't have other things like canisters on the counter. The design is nice and modern. The bowl can be used as a mixing bowl for many cooking jobs. Love the design of this fruit bowl. It has so much room for any fruit I may buy. Assembled in a second, just has 1 screw to put in. Love the clever idea to have the bananas hook incorporated. The look is modern and clean and very functional.